This newsletter is being sent to CNC users as a free service to keep you up-to-date on some of the latest technology and how to get more done in less time and effort. If this has reached you in error or you are not the correct person, email us back at info@solution-ware.com and let us know who the correct contact is. 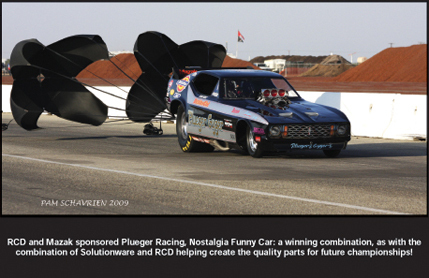 If you are involved in the sport of drag-racing, tractor-pulling, high-performance boats or any sport where horsepower reigns supreme, you are probably familiar with the racing and performance parts made by RCD Engineering, Inc. located in the famous gold-rush area of California. 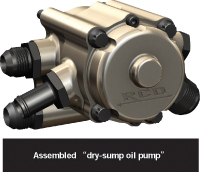 Over the years, RCD has acquired a variety of CNC machines to make the 2,500-3,000 different parts manufactured. Vertical Machining Centers: Enhsu Yasnac, Excell Fanuc, Cincinatti Milacron, Mazak 510C Matrix. Horizontal Machining Center: Toyoda FA450 Meldas control. Turning Centers: Mazak Quick-Turn with F640T; Mazak Quick-Turn with Matrix Nexus and sub-spindle. When RCD manufactures parts on their Mazak and G-code CNC machines, they need a reliable system that quickly outputs the right code. 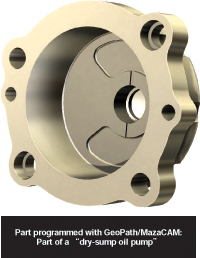 In this industry, parts quantities are short-run and there is not a lot of parts to amortize the programming time, no matter how complicated the part. To stay on top, RCD is continually looking for better solutions. RCD invested in and tried other software after seeing some very nice features in sales presentations, only to later find complications actually running RCD’s CNC machines, so they again turned to SolutionWare’s GeoPath/MazaCAM for results. Natchi Contreras, RCD’s General Manager, says from experience "It’s not just software that makes your parts, a key is the after-the-sale service and support, as you can buy all the software you want and still get nowhere. Needs change and special situations come up and with SolutionWare, we not only talked to tech-support, but when we told them of a particular need we had, instead of being told ‘We’ll make a note of it’ with no action, we were surprised to get an actual software enhancement to solve our issue within days! This support enables us to make parts and deliver on-schedule and that counts in any industry if you want to keep customers and make money. The thing that really surprised us is that SolutionWare’s GeoPath/MazaCAM is less expensive and we get much better service." Natchi continues, "Sometimes people don’t see the value of annual service and updates, but quality service and software updates are valuable, because with the latest features you can create programs faster and cut parts easier. With SolutionWare adding new features, this enables us to handle production challenges even better. SolutionWare continues to evolve their product and that gives us more tools and even smarter tools in the toolbox to get the job done right the first time!" "Ease of use and ease of training are some of the most important factors. ", says Natchi. "With GeoPath/MazaCAM, if you have your geometry, it is so quick to program with, a simple program can be done in 15 minutes. With GeoPath/MazaCAM it takes 10-25% less time than programming with the old method, at the control. Furthermore, when programming at the control, there are various problems programming while the machine is running, so usually the machine is not cutting parts. 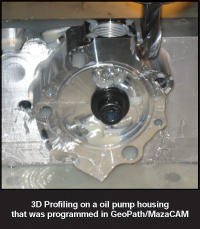 With GeoPath/MazaCAM, we can program on the computer while the Mazak is cutting parts." A further advantage is more efficient machining practices. Take a part RCD machined that has six lobes. "Were looking for something better in the lathe live-tooling milling aspect. With the pattern of 6 lobes, we couldn’t program to rough and finish efficiently, because generating the shape geometry is so time-consuming on the control. Now with GeoPath/MazaCAM, we can place cuts where needed. As with all live-tooling lathes, they don’t have the rigidity of a regular milling machine making it important to make the cuts exactly as needed. We now have a lot more freedom with the cuts, because it is so easy to pick geometry and program." "In today’s competitive world, you need every edge you can get to stay on top and make money. With the latest software updates, we are now making parts that we couldn’t with other software and have made our money back from the cost of the service-agreement in just a few weeks." Now more than ever it is important to work as efficiently as possible. 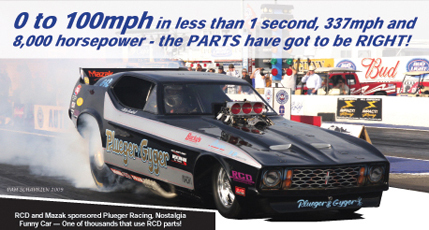 You owe it to yourself to find out what is available to help get parts made faster with less effort and time. New feature: Allow user to select tools from Tool-File (instead of Tool-Data). Many Mazatrol prompts added and improved. Many enhancements to selecting tool for Tool-Data etc. Option to rotate geometry if WPC contains a Theta number. Add Files > Comments (for file-kinds that support comments), this allows the user to edit the comments here. T32/T+/F640T can now optionally remove live-tooling menus. Visit the forum that is all about Mazatrol. Copyright © 2009 by SolutionWare Corporation. All rights reserved.